The official UKZ website states a teaser track will be released later today. Finally! UKZ features Eddie Jobson on keyboards, Trey Gunn on the Warr guitar, Marco Minnemann on drums, Alex Machacek on guitar, and Aaron Lippert on vocals. This band first started working together remotely last year, but the project stalled. Word is they did some rehearsing recently and have done a bit of recording. If/when this teaser track goes up, I'll post a link to it here. Stay tuned. UPDATE: You can now download the track. I just got it; it's great! Click here to purchase "Tu-95" for .99 cents. Allan Holdsworth Glasgow video - "Devil Take The Hindmost"
Here are some upcoming live dates for guitarist Carl Verheyen. All About Jazz has posted a great review of McCoy Tyner's new album Guitars. This album features guitarists Bill Frisell, Marc Ribot, John Scofield, and Derek Trucks, along with banjo legend Bela Fleck. Can't wait to hear this one. This Friday marks the fifth anniversary of Shawn Lane's passing. I was lucky enough to meet Shawn in 1993, and saw him perform live twice. He was without a doubt the most talented guitar player I have ever seen or heard. If you are a Guitar Channel reader you are likely familiar with Shawn's playing, but you may not know that he suffered from psoriatic arthritis for most of his life, and was in chronic pain for many years. Jessie Baker has written a great piece about Shawn for FOG Magazine; an online publication that provides education and support for chronic pain sufferers. I encourage all of you to read this article to learn more about Shawn and the debilitating medical issues he coped with on a daily basis. This is OHM playing "Where's My Hat" at Brick by Brick in San Diego, California, September 20, 2008. Paul Gilbert's Silence Followed By A Deafening Roar Guitar Instructional DVD And Shred Annex which was announced, then delayed, now has a Japanese release date of Sept 24th (thanks Laurie!). NOTE: this version is a Region 2 DVD - it will only work on Region 2 (Japan, Europe, South Africa, and the Middle East) or Multi-region DVD players. I'll keep an eye out for a US release date.
" I am putting the finishing touches on a new DVD entitled, "Silence Followed By a Deafening Roar Guitar Instructional DVD and Shred Annex". It will include bonus features such as printable tablature, downloadable backing tracks, rare concert footage, and most importantly, the SHRED ANNEX which should keep your fingers busy for a long time. Of the course the main focus of the DVD is the most interesting guitar moments from the "Silence... Roar" album. I explain these in detail, as well as give you my ideas behind the songs and more, more, more! Release dates coming soon..."
You can order the DVD from CDJapan here. You can also order it from Play.com (UK) here. NOTE: there is a commenter on the Play.com site who states the downloadable tracks and tabs did not work on his DVD. Not sure if this is an isolated issue; I'll post an update if I hear more on this. 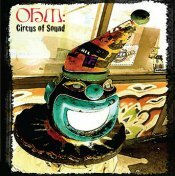 Circus of Sound (Tone Center) is the latest release from the SoCal-based instrumental power trio OHM. The core of the band has always been ex-Megadeth guitarist Chris Poland and bassist Robertino "Pag" Pagliari; two highly original players whose styles are instantly recognizable. Several drummers have played with OHM through the years, and three of them (that's right, three of them) appear on Circus of Sound - Joel Taylor, Frank Briggs, and the band's longest tenured drummer Kofi Baker. OHM could best be classified as "heavy fusion," but their sound and style are unlike any other band in that genre. Yes there's distorted guitars and heavy riffs - but the unique styles of Poland and Pagliari, and more importantly the band's writing, give OHM a very distinctive flavor. Poland is one of fusion's truly great guitar players; silky-smooth runs and a liberal approach to bending are the hallmarks of his style, and this new album will not be a disappointment to his fans. Circus of Sound seems to have more guitar solos per square inch than any of OHM's previous releases. Pagliari plays a six-string fretless bass, often employing a wah-wah to accent his lines, and is just as responsible for the band's unique sound as Poland is. Traditionally, OHM has had a stripped-down sound. The minimal use of overdubbing has given their past studio albums OHM (2004) and Amino Acid Flashback (2005) a live feel at times (the band also released Live On KPFK 90.7 FM in 2004 which actually was recorded live). Circus of Sound is a change of direction in this regard. A lush recording full of layered guitars and harmonies, Circus of Sound is OHM's richest-sounding album to date. The material is a change of pace as well. Overall, the writing seems less eccentric than it's been in the past. While the band's signature off-kilter sensibilities are still present here, on the whole the compositions are more approachable than they've been on OHM's previous releases. Songs such as "Fun House," "Abracadabra," and "Steps From Home" are among the most melodic, "tuneful" pieces OHM has ever recorded. There's some complex, tight arrangements on Circus of Sound also. The point-counterpoint middle section of the fantastic title track is a good example. "System of a Clown" is another great song with a deep, layered arrangement. Drummer Joel Taylor take a nice solo on this track as well. As "out there" as OHM's music can sometimes be, there's often a strong undercurrent of blues in their songs. This is largely due to Poland's input, and the new album has many great examples - on tracks like "The Shortest Straw" and "You Don't Know," he peels off plenty of wicked-fast blues runs that leave you either shaking your head, or reaching for the rewind button for another listen. The funky "Mr. Brown" is another tune with a heavy blues vibe. It's also one of the best tracks on the album. Pagliari in particular sounds great on this song. Circus of Sound is OHM's most ambitious album yet, and it succeeds on every level. It's a more expansive production than anything they have released in the past (more guitar parts, more solos, more players, etc), and it's one of the best heavy fusion releases of the year so far. Oteil Burbridge interview "I Like What I'm Herring"
Very cool interview where bassist Oteil Burbridge talks about working on Jimmy Herring's new album Lifeboat.